Newspaper Headlines and Your Headlines. | Why Be Tonto? Newspaper Headlines and Your Headlines. TIGER PUTS BALLS IN WRONG PLACE AGAIN. I’LL KICK HIM IN THE BALTICS. 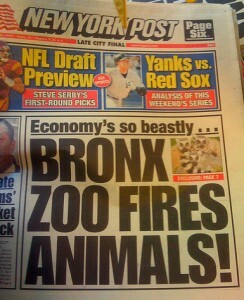 You don’t need me to tell you headlines like these stop people and sell newspapers. They break the pattern of indifferent communication; they get people talking. But how about marketing and advertising headlines? Modern advertising can be largely wordless, but you could argue that the words that feature are more important than ever. So to get attention and change minds, are we doing enough to write riveting headlines and content? The opinion of those at a recent seminar is telling. We heard that emails and Websites are often written in the old school broadcast way. One-way communication. They interrupt an audience and tell a story from their point of view, rather than the view of the prospect. Maybe some marketers out there should stop taking their own advice. Then we heard something about ‘acceptable work’. It’s content that’s ‘okay’ as it ticks all the boxes. Who sets out to create content that’s just okay? Moreover, who has the patience to read content that’s merely passable? The good news is that you can begin to remedy all this in a weekend. A study of the advertising award books can help you develop messaging with more attitude and thus, more stopping power. It can help you acquire a greater respect for your target audience and build an appreciation for their problems, needs and desires. Think of the award books as a resource. They can help you perfect strategies and create work that gives you an advantage when it comes to competitive forces. After all, isn’t the purpose of better content to make it easier for you to compete? Equally, you can learn how to add greater appeal to generic products and those that are short on charm and appeal. It might have been Bill Bernbach who said there are no boring products, just boring writers. More to that, there’s was a newspaper story about the bureaucracy of a local committee on road improvements. Not exactly a fascinating subject. 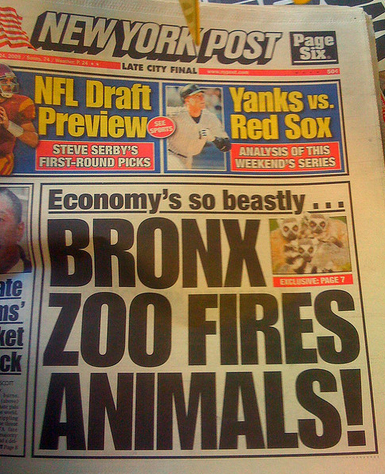 But those NY Post editors were at it again. Their headline was anythting but boring. RED TAPE HOLDS UP NEW BRIDGES.